To achieve support by as many people as possible, we need to collaborate widely in their creation. If people are not involved in their production they will feel that the principles are being forced upon them and so will resist them. Often a good starting point for this process is to run a workshop. Like so many things in digital, there is no definitive way of running a workshop to establish design principles. However, I can share with you my approach. I tend to make the workshop open invite. In other words, I encourage anybody who wants to come, to attend. When I invite people, I make a point of emphasising that the workshop will lay the foundations for digital moving forward and so is a crucial moment in the companies future. That encourages as many people as possible to attend. However, I do ensure specific critical stakeholders can attend before setting the date. You want at least one senior executive in the room as well as a cross-section of your digital team. 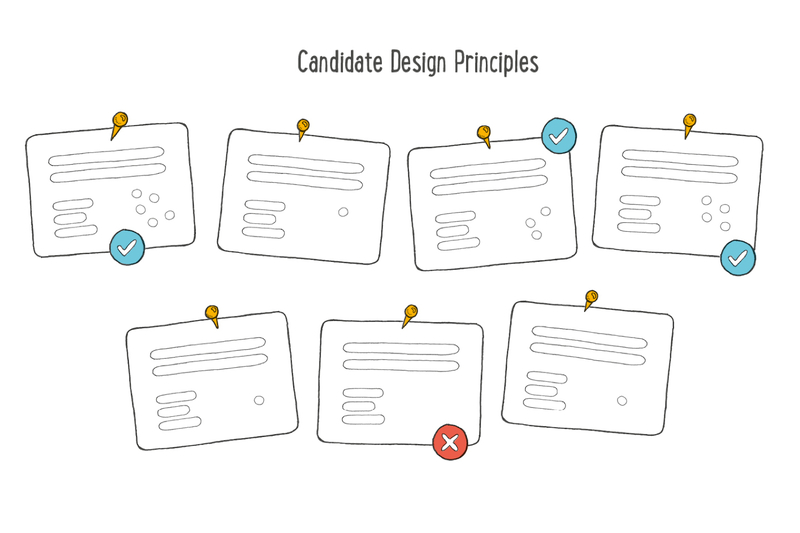 In preparation for the workshop, I will research the design principles of other companies and make a collection of between 30 and 50 candidate principles to start the discussion. 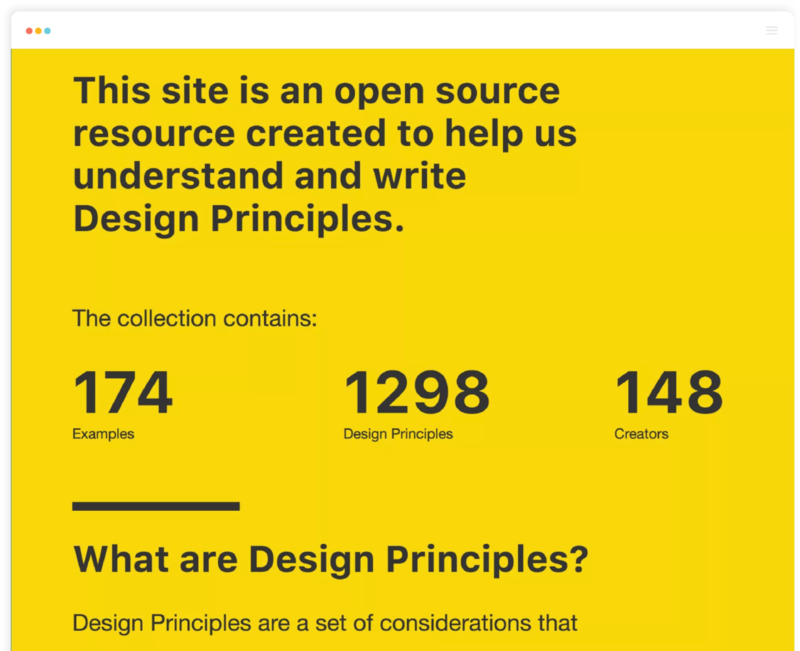 A site like Principles.design is an excellent source as is Design Principles FTW. It is always good to give people a starting point, as coming up with principles from scratch can be hard if you have never done it before. Print each principle you have found on a separate card, and have enough sets of cards to allow for multiple groups in the workshop. Once your workshop starts, split attendees down into groups. Pairs are okay if the group is small, but never have more than about six people in a group as quiet attendees will end up feeling that others have not heard their opinion. Give each group a stack of cards and ask them to narrow the options by discarding cards they do not consider a good fit with the company. They should also feel free to create cards if they come up with an idea not listed. However, by the end, they should be left with no more than ten cards. Once that is done, bring the groups back together and compare cards. Group duplicates together as this will enable you to see which cards proved more popular. Lay out all of the options on a table for everybody to see. At this point, you probably have more than ten cards, unless all the groups completely agreed. You reduce the list through dot voting. Dot voting is a technique for avoiding endless discussion in all kinds of areas. Each person is given three votes in the form of self-adhesive dots. They can stick these dots on a card that they think should be included in the final list. They can either place all three dots on one principle or spread their votes across several cards. If you have more senior stakeholders in the room, you could choose to give them more dots. That will reduce the chances of them overruling any decision later. Once the group has voted, you will be able to see which cards don’t have much support. You should remove these cards until you have less than ten remaining. At this point, it is worth discussing the remaining cards. In particular, ask the group what the cost of implementing the card would be. In other words, if we adopted the approach outlined on the card, what would the company have to do differently. For design principles to have any value, they must encourage the organization to work in new ways, and that will inevitably come at a cost. It is essential that everybody is clear about that cost going in otherwise the design principles will quickly become nothing more than hollow words. That is why, in my design principles workshops, I encourage attendees to think through the consequences of the design principles they have selected. Split your attendees down into small groups and give each group one or more principles to discuss. Ask them to write down one or two sentences outlining how the company would need to change the way it works if they implemented the chosen principle. For example, if your principle was: We prioritize user needs above all else. The supporting statement might read. For example, we will focus our digital channels on addressing user questions rather than pushing our agenda through marketing campaigns.. This discussion is not always comfortable. When attendees start to consider the cost of the principles, they may wish to revise them. That is okay and may be necessary. But it is better to have this discussion now, rather than in the midst of a project. But be careful. Do not allow your design principles to become so watered-down that they are virtually meaningless. Not all design principles have value. A good design principle should stand for something. In other words, it should come at a cost. By implementing your principle, it should mean stopping doing something else as I outlined in the example above. But there is more to a good design principle than that. A good design principle should also differentiate you from the competition. One way of knowing whether your principle differentiates you is to look at its opposite. For example, if your principle is “we put customers first”, the opposite would be “we never put the customer first”. There is no way a company would ever take that position if they wanted to stay in business. That is a sign that your principle fails to differentiate and so needs work. But a principle such as “we build for everyone” does work because the opposite, “we focus on a specific audience”, is a legitimate position a company may choose to take. Not that all of your principles need to be like this. Some of your principles will need to exist to counterbalance an inherent, and often unspoken, bias in company culture. For example, if decision making tends to be driven by the gut instinct of the most senior person in the room, a principle such as “we make decisions with data” may be required. But, although some principles need to encourage new behavior, others can also reassure. Digital working practices often clash with existing culture, and that can make people nervous. That nervousness can lead to resistance, which we want to avoid if we are to make our projects as e cient as possible. We validate ideas through continual testing. That would not only reassure; it would also educate colleagues about best practice in digital. Let data drive decision-making, not hunches or guesswork. Keep doing that after taking your service live, prototyping and testing with users then iterating in response. Analytics should be built-in, always on, and easy to read. They’re an essential tool. They also link to more detailed information on why this is the right approach. Without this context, the principle may well make little sense to those outside of the digital field. That brings us to the question of how we should be using our design principles. The worst thing that can happen to a set of design principles is that they end up in a drawer somewhere and nobody looks at them. Often being consigned to an intranet page is an equally unfortunate fate. For design principles to be useful they have to be visible. Only then can they start to change people’s thinking and shift company culture. Shift it in a way that breaks down departmental barriers, linear project management processes and other business practices that undermine the efficiency of delivering outstanding digital services. Achieving this will involve tapping into your inner marketer. You need to come up with creative ways of making sure your design principles are in front of people all of the time. At the most basic level, this will involve merely referring to them a lot. I once worked with a client who had no culture of testing but instead relied solely on endless debates to make decisions. Unfortunately, the digital team had no authority to change anything. My suggestion was that they just started saying “let’s test that” every time there was disagreement or a decision to be made. I knew that others would reject the idea initially, but I encouraged the group just to keep saying the same words every time an opportunity arose – “let’s test that”. By repeating the same phrase, again and again, it eventually started to stick in people’s heads. Finally, in one particularly heated debate, the senior manager in the room just got so frustrated that she said: “let’s test that and see”. Before long it became a mantra in the company and culture began to shift. But endlessly repeating your design principles won’t get the job done alone. That is where you need to get creative. Turn your principles into posters, add them to mouse mats, replace everybody’s default screensavers. Don’t wait for permission, just do it. Sneak into the office at night and replace all those framed pictures of executives accepting awards with posters of your design principles. If nothing else, it will get people talking! Hold lunchtime sessions which explain the principles, and bribe people to come with food. Start wearing t-shirts with the principles printed on them. Hand out postcards with the principles on at the start of every project. Do whatever it takes to ensure people can’t ignore them. Only then will they start to make a difference. Admittedly this sounds like a lot of work. But it is worth it, because if you can embed these principles in organizational thinking – your digital projects will become considerably more effcient, and you will save a lot of time and money. But, design principles do not live in isolation. They exist alongside other tools. Tools that are collectively known as a design system – which you can read more about in our eBook: download it completely free of charge. Would you like to create your own design principles? Try the Frontify Style Guide for free for 14 days. 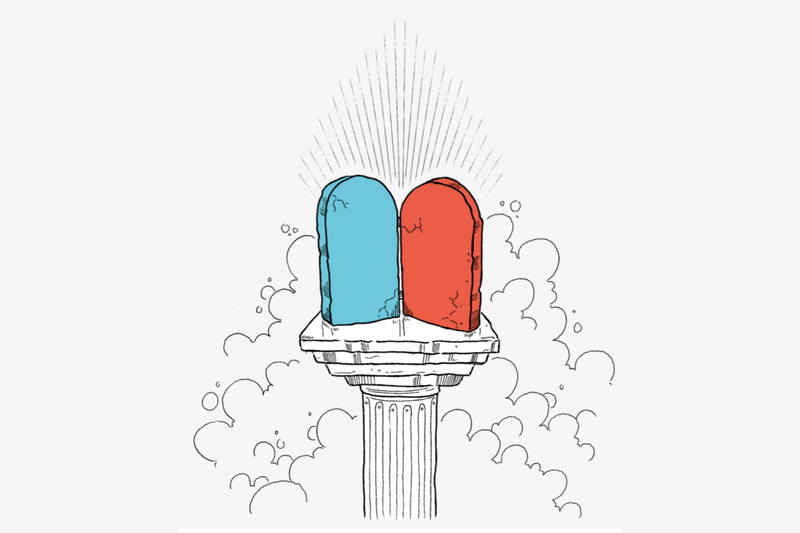 Read part 1: Design principles: what are they, and why do we need them?